The golden opportunity for Chinese start-ups to "go Latin" may have arrived. Things have been looking good between China and Latin America, with trade multiplying 22 times since the year 2000, a stark contrast to Latin American trade with the US, which merely doubled in the same time period, according to Angel Melguizo, chief economist at the Development Centre of the Organisation for Economic Co-operation and Development, an intergovernmental economic organization. In 2015, China promised $500 billion in trade and $250 billion in direct investment to Latin America within a decade, with infrastructure being one of the key areas of cooperation. But Chinese involvement in Latin America is not just about infrastructure. As competition among Chinese start-ups grows fiercer domestically, many firms are looking overseas for new opportunities. 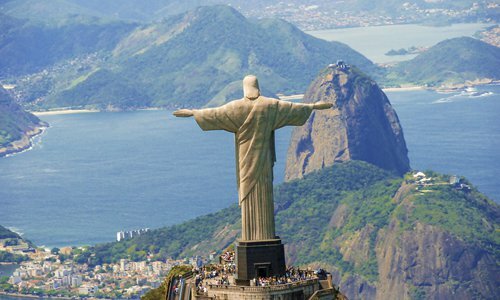 Latin America stands out in the global market as it wakes up to tech start-ups and is expected to become a battleground for global tech giants in the years to come. China's Transsion Holdings, a mobile phone manufacturer which dominates the African market, is expanding to Latin America with the launch of its new phone in March 2017. 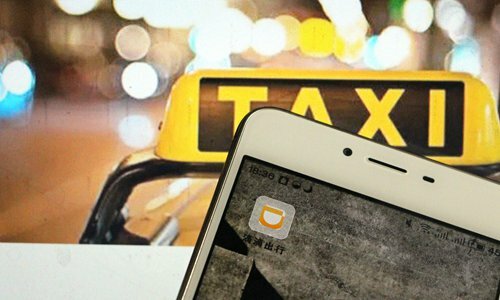 This January, China's ride-sharing giant Didi Chuxing purchased 99 Taxis, Brazil's leading ride-hailing company. In February, Mobike, one of China's biggest bike sharing platforms, launched in Chile. Smaller start-ups have also started to enter the Latin American market. Some may have never set foot in the distant land, but have nonetheless developed popular local apps from their offices in China. Others, like Noticias Aguila, a news aggregator developed by Shenzhen Inveno Technology, managed to set up an office in Mexico, attracting over 20 million users and over 10 million Facebook followers within less than two years, becoming the biggest mobile media platform in Latin America. The company started out as a news aggregator in China until its CEO, Tang Xin, a former Tencent employee, started to worry about the growing domestic competition. "Competition in the news aggregator market in China is extremely intense. Apart from us, there are a lot of big players. There are vast blue oceans out there, why do we limit ourselves in this red ocean?" Tang told China Entrepreneur magazine in 2017. In the business world, a blue ocean refers to market space untainted by competition, while red ocean refers to the competitive, "bloody" existing market. Taking advantage of his experience in the Chinese market, Inveno launched Noticias in Mexico, Argentina, Chile and Columbia, and has now become one of the most successful examples of Chinese start-ups in Latin America. Hao Jie, an entrepreneur and partner at Magma Partners, one of the leading high-tech funds in Latin America, describes Latin America as a "virgin land" for start-ups, largely unnoticed by global capitals until just a few years back. He expects more Chinese start-ups to join the Latin trend in the coming years. To help Chinese entrepreneurs launch in Latin America, Magma Partners recently launched the Sino-Latin American Accelerator, based in Shanghai. In the meantime, many Latin-American start-ups are looking to China for opportunities. They include ClearingPoint, a Shanghai-based fin-tech start-up founded by Latin Americans offering international payment solutions between Asia and Latin America. 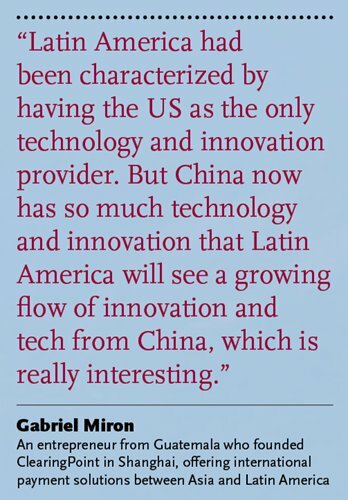 China has a competitive start-up environment, but Gabriel Miron, an entrepreneur from Guatemala who founded ClearingPoint two years ago, believes his start-up has a special niche in the marketplace as trade between China and Latin America grows and large amounts of money is expected to flow in between. Miron had been conducting remittances between Mexico and the US for years until he decided to pivot to China after learning that large amounts of money transfer between China and Mexico every day. Still at an early stage, ClearingPoint is presently applying for financial licenses. Arriving in Shanghai two years ago, Miron was among the first batch of Latin American entrepreneurs in China. "There are a lot of Latin Americans doing trade in China. But in the case of technology and innovation, it's a smaller group, learning the best practices and know-how in China. It's a trend right now, it's small, but it might grow in the future," Miron told the Global Times. "Latin America had been characterized by having the US as the only technology and innovation provider. But China now has so much technology and innovation that Latin America will see a growing flow of innovation and tech from China, which is really interesting," he said. Miron was impressed by the speed of Chinese businesses and the fin-tech industry. "The pace of technology and innovation that China has in start-ups and in fin-tech is amazing and exponentially better than anything in Latin America and the US. The speed of innovation and progress is much more advanced than in any other place," Miron said. "The Chinese mentality of doing business is something really amazing and it helps us to mature and improve our business skills. The challenge becomes strength," he told the Global Times. The trend occurs at a time when US President Donald Trump has been neglecting Latin America and repeatedly insulting Mexico, leading to unfavorable views of Mexicans. Hao says many Latin American entrepreneurs are increasingly disappointed by US investors. He quotes the CEO of a Latin American company as saying, "I feel like Silicon Valley is disappearing. Investors from Silicon Valley are more interested in the proportion of racial and ethnic minorities in my company than what we actually do in business." As a result, when the Latin American companies now see a Chinese face, they are eager for cooperation. "If you have a yellow face, you'll find the entire world smiling at you," Hao said. The saturated market in the US is another reason why some Latin Americans are turning to China and Chinese funding. "As a foreigner not living in the US nor China, it is easier to secure funding in China than the US, as there are many more foreign companies trying to go into the US market," Miron said. Investment in Latin America, however, has not always been smooth for China. Many Chinese State-owned companies, which started to invest in Latin America over two decades ago, have made unsuccessful business investments in the region in the past due to a lack of knowledge of local culture and political risks. ShougangHierro Peru, a unit of China's Shougang Group, one of China's biggest steel companies, for example, is often hit by local strikes and protests against the company. Hao said for Chinese entrepreneurs, it is important to respect the core values of each country. "Many people think adapting to local culture is the biggest concern when you enter a new market, but more important than culture is a respect to the universal values, such as honesty and reciprocation," he said. Understanding the culture of countries in Latin America is also important, considering that there are 20 countries in the region, each with different political and social environments. "Cultural difference should not be seen as a barrier, but steps to success," Hao said.